Dunbar, C. O., Condra, G. E., 1932. 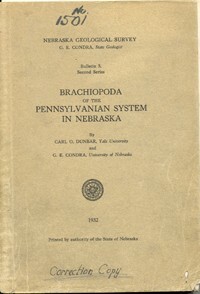 Brachiopoda of the Pennsylvanian System in Nebraska (GSB-5): 400 pp., size 6.5" x 10". Description: This report, on the paleontology of the Pennsylvanian System of Nebraska and adjacent areas, presents the bryozoa, cephalopods and other classes of invertebrates.